Auction designer with Dropbox integration. Is there a better alternative to Auction Listing Designer - Dropbox Edition? 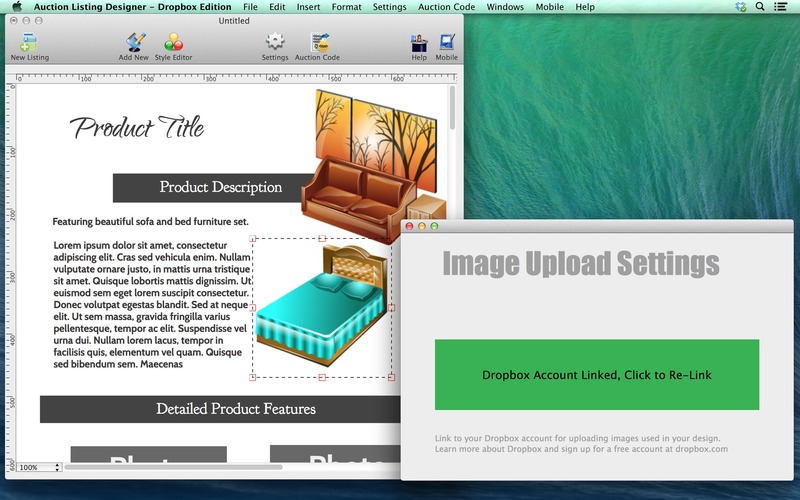 Is Auction Listing Designer - Dropbox Edition really the best app in Productivity category? Will Auction Listing Designer - Dropbox Edition work good on macOS 10.13.4? Auction Listing Designer - Dropbox Edition helps you create beautiful and professional listings, compatible with eBay and other auction sites that accept HTML descriptions. This special Dropbox edition is integrated exclusively with your Dropbox account for storing images used in your listing design. Auction Listing Designer - Dropbox Edition needs a review. Be the first to review this app and get the discussion started! Auction Listing Designer - Dropbox Edition needs a rating. Be the first to rate this app and get the discussion started! Save, update and reuse. Save your customized listing designs and make copies of your work so you can increase your productivity by creating once, update and reuse! Automatically generate thumbnails linked to full size images Resize image thumbnails within the App, automatically link thumbnails to its larger full resolution versions. Create and update listing templates on the go Available for iPhone, iPad and Mac. The iOS edition is sold separately on the iOS App Store. This App generates HTML code based on your design, so you wouldn't need to write a single line of code. But if you are tech savvy, you will have the option to modify 100% of the generated code as well! To publish a listing on eBay, simply copy and paste the code into the Description field of your auction listing and you're all set!